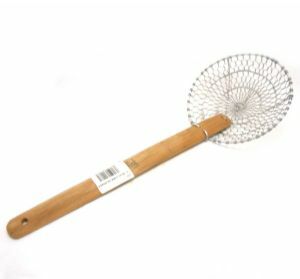 Chinese Wire Skimmer [Strainer/Spider] | Buy Online at The Asian Cookshop. A Chinese Wire Skimmer/Strainer is a unique, handsome, and practical piece of cookware. The Chinese skimmer lifts out Oriental foods and pasta, wontons, ravioli, and tortellini from boiling water or fried foods from hot oil.